Look at our beautiful Amish made Queen Anne style entertainment center, with pocket doors and tape drawer. Shown in solid cherry wood, it is the perfect choice for someone doing a Victorian theme in their home, and wanting the quality and craftsmanship of Amish made furniture, or just someone who has other Queen Anne furniture and wants their entertainment center to match. 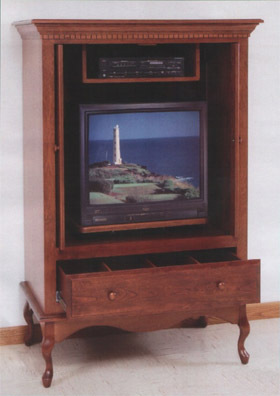 This unit features sturdy metal drawer slides, a VCR pocket, and a slide-out TV shelf with a swivel top. The raised panel pocket doors conveniently slide back inside when open, for a neat, uncluttered appearance. TV opening is 36” x 36”. Usable space inside for TV is 32.5” Wide, 26” High and 23” Deep. Swivel is approx. 3” High.